Turner and IMG's ELEAGUE, in partnership with Warner Bros. Interactive Entertainment, will continue live coverage of the first-ever ELEAGUE Injustice 2 World Championship presented by PS4, with eight players facing off for the final two spots in the championship round. 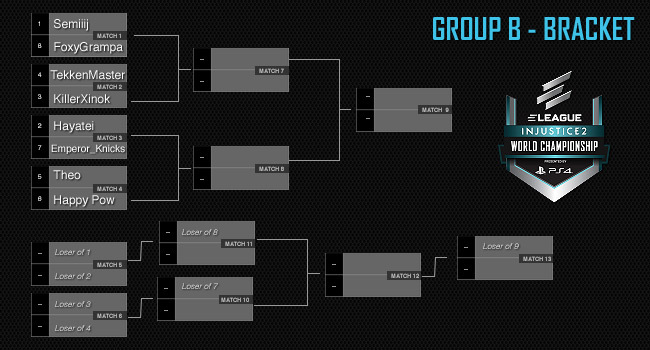 Live Group B coverage will include a showcase of the bracket's final matches, Friday, Nov. 3, at 10 p.m. on TBS. Fans can follow live digital coverage of Group B matches beginning Friday at 6 p.m. across Twitch, ELEAGUE.com and YouTube. Group B will feature multiple players who earned Top 10 finishes in the game’s first season of global professional competition. Headlining the group is Catwoman star Andrew “Semiij” Fontanez, who ended his season ranked No. 2 in the Injustice 2 Pro Series. Coming off a Pro Series Grand Final that saw him defeated by Dominique “SonicFox” McLean, Semiij will have a rare opportunity at ELEAGUE to face a field that no longer includes the now-eliminated SonicFox. Jivan “Theo” Karapetian, the Pro Series’ third-ranked player in the world, will also highlight Group B’s best-of-five, double-elimination bracket. Live TBS coverage will continue Friday, Nov. 10, at 10 p.m. with the championship round. Live Twitch, ELEAGUE.com and YouTube coverage will also begin at 10 p.m. for the championship round.